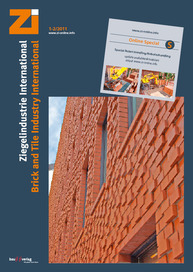 In 2010 Sabo delivered machines to increase production capacities and improve product quality at the Cihelna Hodonin Brickworks in the Czech Republic. In the first stage, Sabo was charged with the supply of all machines from loading and unloading of the dryer frames up to setting of the kiln, and completely new equipment for the kiln. The target of the modernization was to up the daily capacity of 140 t (produced on two lines) to 300 t on one line. Sabo supplied both new machines and modernized the existing equipment so that the company can produce 41 different products on only one line. On the wet side, a robot is used to load the dryer frames. Special grippers were designed for the robot so that it can load all types of products onto the dryer frames. A new storage system for empty dryer frames was installed to enable the line to feed the chamber dyers with sufficient frames. The installation was designed based on all types of products to be manufactured and the requisite capacity for each product. 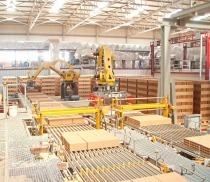 For loading the kiln cars, a new robotized setting machine was installed. It has all equipment necessary to set packs in different configurations (wall setting for blocks, tilted, etc). This ensures maximum flexibility and quality during firing thanks to an ideal setting. The installed dryer was in good condition, and could meet the capacity requirements. But the company decided to invest in a new ventilation system. This key investment comprised a heat generator and an automatic system to control it. Such a system does have a great impact on the energy consumption of the dryer. New fans as well as new burners were installed. As an automatic control system was installed, the kiln could be described as having been completely overhauled. Particular importance was attached to minimizing heat losses from the kiln with the installation of four doors, two at the entrance and two at the exit. 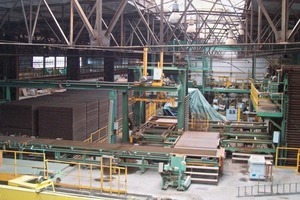 Most of the equipment of the existing automatic transport system for the kiln cars was replaced. Robot dehacking machines were installed to unload the kiln cars. 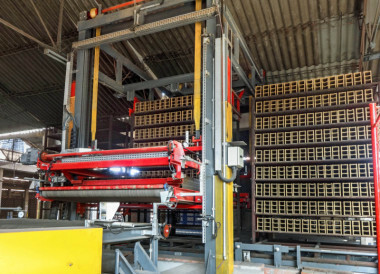 The line is equipped with all the necessary equipment to set and dehack packs with different configurations (wall setting for blocks, tilted etc). This ensures maximum flexibility and quality in the formation of different packs in line with market needs. The new automatic line with a Wassmer grinding machine was designed to produce 500 t/day fired ground product with the possibility for a further capacity increase in the future with minor modifications. Robots are used in all critical parts of the line. Diamond tools are selected based on the results of individual product tests on the grinding line. For cleaning the kiln cars and their preparation for setting, a new kiln car cleaning machine was ordered from Sabo. With regard to preparing the kiln cars for setting, the focus was on ensuring an optimal car setting and the associated stability of the dried product packs.